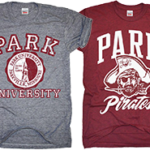 Check out the latest Park University merchandise from our favorite vendors. 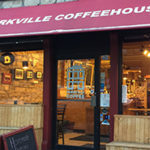 Wear your favorite Park University t-shirt, grab some Pirate Brew and you are ready to go! 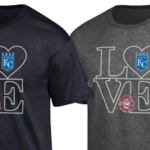 Vintage collegiate t-shirts exclusively available at Charlie Hustle and Made in KC Briarcliff. 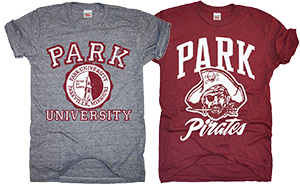 The online Park Spirit Store offers a wide array of Park merchandise, including Park Pirates and alumni apparel, device covers and more. Coming soon – Gilbert Buccaneer merchandise! 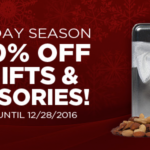 The Park University bookstore is your source for school supplies, books, t-shirts, snacks and many other general student needs. 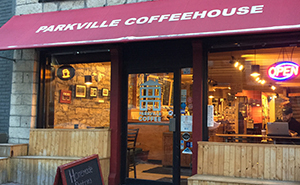 Pirate Brew is available at Parkville Coffee in Downtown Parkville, on the Parkville Coffee web site and in some Kansas City area grocery stores. Learn how you can become a licensed Park University vendor.